Hair Loss can be a devastating condition. Only those who have experienced it can truly understand the level of anxiety and social discomfort it can cause. At Alvi Armani, our goal is to let each patient know that they are not alone and there is a solution to this problem. From their initial consultation to their critical post-operative care - Our staff works diligently to ensure each patient is cared for above and beyond their expectations. Read through our many letters of thanks submitted by actual Alvi Armani patients. See for yourself their thoughts and opinions on the care received by Dr. Armani and his entire staff. I would like to take this opportunity to thank you for your kindness and incredible service when I visited you in Toronto last week. After tireless researching for 6 months I decided to use Alvi Armani and I am extremely glad that I did. Whilst your service and attention to detail was second to none, it was actually you personally that made the experience so much more comfortable and unlike most in the industry, you made me feel like a very important client who was always available to answer my questions. Most are just happy to take your money and run but it was your integrity that impressed me I will have no hesitation to recommending you to several of my friends who have been looking at having the same procedure. If you require anything else from me or would like to use my email as a testimonial then you are more than welcome too. Once again thank you and I look forward to seeing you again in Dubai or LA next month. I have to tell you that my experience at the end of February was wonderful. From Eric staying on top of things to make sure my paperwork was all in and Kim getting my blood work setup and finding me a hotel, to the whole crew performing the procedure, your team is wonderful. I have to admit that it was actually enjoyable to have had my procedure performed by such a knowledgeable and fun group. The banter we had between everyone made the 14 hour first day easy to get through and made the time go by quickly. You really should look at giving everyone a big raise or buying them a new home as I am going to speak their praises to everyone I know in my situation. I truly look forward to seeing the results from the procedure and am already excited when I see the work performed. I believe that this is going to turn out better than I had anticipated. Thank you and your team again for a wonderful time and keep up the great work. From the first time I looked at Dr. Armani's website and saw the patient results I knew that no other doctor could come close to the results he provides. The hairline design and temple angle closure is just unmatched in the industry. Scheduling the surgery was very easy and on the day of the surgery I couldn't have wished for better treatment. The whole staff was extremely kind, helpful and friendly and I was taken excellent care of. The operation itself was a breeze, I hardly felt any pain and was able to sleep through a lot of it. Dr. Armani and everyone else were very caring and Dr. Armani even gives you his home phone and cell phone number in case you need anything. There was no post-op discomfort at all and in general my whole experience with AlviArmani was just excellent. I would really like to thank Dr. Armani for giving me a whole new lease on life - as it is very depressing for a young guy like me to look 10 years older - and also your employees who are always quick to answer any questions I have and who are just extremely kind and very helpful. I wanted to thank you for the way you received me and provided your services. I liked your personality and the general flow of the events. I am very pleased with my experience at Alviarmani. I believe you are a Godsend for all of us who suffer from hairloss. You came forth into this world to restore our confidence enabling us to move forward with our lives and have once again the possibility to achieve greatness. I deeply honor you for that. I wanted to email and say thanks for everything you and everyone at Alvi Armani has done for me. All your staff was more than gracious and professional and went out of their way to make me feel comfortable. I want to give a special thanks to Caleb and Renee. Those two went above an beyond. I think you have two people who work very hard for you guys to make the customer happy. Of course I cannot say enough about what you and Doctor Armani have done for me as well. Thank you both for everything. Dr. Armani was a pleasure and her thoughts of my new hair line were just what I hoped for. The surgery staff was there to accommodatedate me and my comfort as much as to do their jobs with the procedure. The surgical manager spent the extra time after my surgery to let me know just what to expect in upcomingeing days and months. People like my coordinator David set a mode for your expectations and he was 100% correct. It was what you would expect. At 7 months post-op, I am already more than happy with the result. Dr Baubac has helped me to achieve a result that is very natural and has improved my looks and my quality of life. Choosing Alvi Armani for my hair restoration was the best decision I have made. 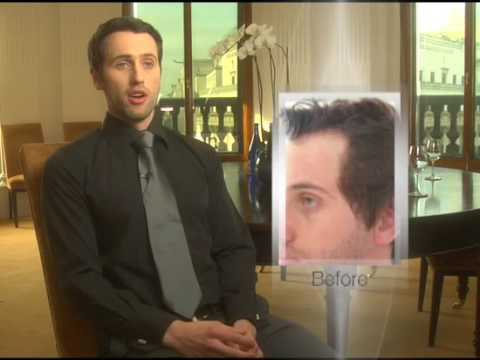 – Alex A.
Dr. Baubac is a true surgical artist and one who is gifted with an inherent ability to create a natural looking hairline to mimic your natural growth pattern for a virtually undetectable look. Seeing the Alviarmani website gave me the right push that I needed to take action. I feel much better after getting my youth and confidence back. When I think about all that Dr. Baubac has done for me I can't help but get all choked up.